The DW Stadium, named after owner Dave Whelan of the club’s sponsors DW Sports Fitness, has been home to Wigan Athletic since 1999 after they moved from Springfield Park, where they had played since 1932. The stadium is also shared with Rugby League club Wigan Warriors. Wigan were officially the first away team to win at the DW Stadium, playing a first round FA Cup tie against Cambridge City as the away team as Cambridge’s stadium was unsuitable to host the match. The stadium itself is made up of four single tiered stands, with exposed corners, and an electronic scoreboard situated above the East Stand. 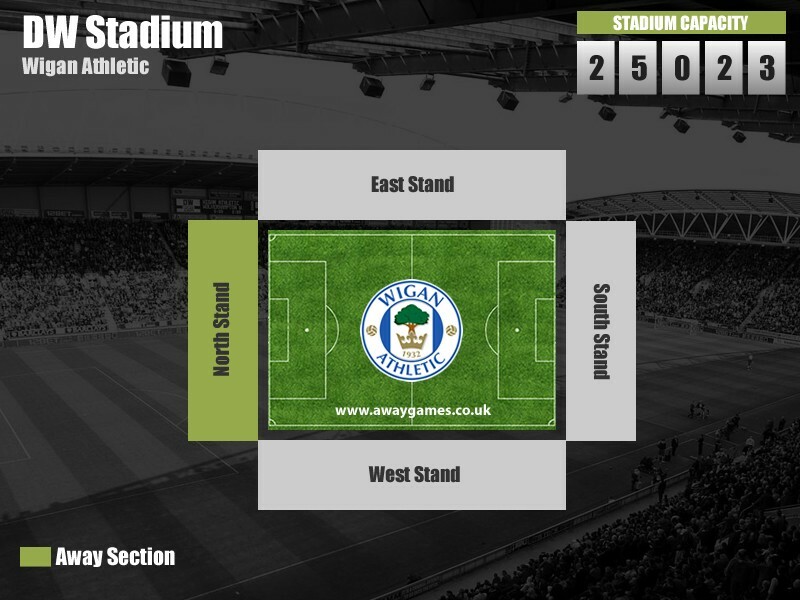 Away fans visiting the DW Stadium are located behind one of the goals in the North Stand, with a typical allocation of 4,800, which is amongst the largest in the league. The DW Stadium is blessed with a huge car park behind the away end, meaning parking should be quite a simple task when going to Wigan away. Be careful though that you don’t park on the nearby Retail Park, where there is a maximum stay of 2 hours and a £50 fine for those who outstay this. We’ve compiled a list of car parks, below, near to the DW Stadium for hassle free parking while you’re at the match. DW Stadium – Car Park 1 WN5 0UN £5 0.1km Car Park 1 is reserved for away fans, and is a 2 minute walk to the away fans turnstiles. The only downside is there can often be a delay in exiting the area due to the large volume of matchday traffic after the game has finished. The closest railway stations to the DW Stadium are Wigan North Western (on the west coast mainline) and Wigan Wallgate (served by trains from Liverpool and Manchester). They are virtually opposite each other and both around a 20 minute walk to the stadium. If exiting from Wigan Wallgate, walk south on Wallgate Road until you get to Wigan North Western station. Turn right on to George Street and follow this road until the end, where it bends round to become York Street. Turn right in to Miry Lane and follow this road until you can turn left in to Pagefield Industrial Estate. Walk straight across through the alleyway and over the bridge. Turn right on to Stadium Way and follow this until you reach the DW Stadium. There are a number of away friendly pubs near the DW Stadium, all of which cater to different needs. Please note, however, that some bars require club colours to be covered and some do not allow children. However, rather than take our word for it, we want to give you the view from other away fans who have visited the DW Stadium. Over the coming months we will be building up fans reviews of the best places to drink on an away trip to Wigan Athletic, and you’ll be able to find them here. Wigan offers a variety of overnight accommodation to suit all budgets. 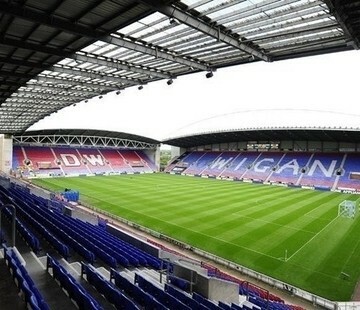 See what other away fans think of Wigan Athletic’s DW Stadium in our ‘Away Day Reviews’. See how Wigan Athletic perform in our away day rankings, where away fans rate the pie, pint, cuppa and away day overall.